Behind the Lines 2012 includes work from the nation’s most esteemed cartoonists. 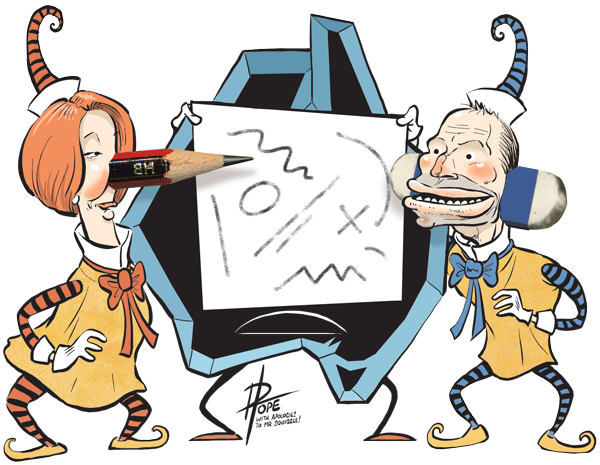 The cartoons were chosen from almost 600 submissions and include works from the Museum of Australian Democracy’s own collection. Some of the cartoons may be familiar, having already received critical acclaim through media exposure. We hope that the familiar journeys of the past political year will seem fresh again through the perspective of this exhibition. We invite you to muse on the artistry of the cartoons as well as the democratic institutions and values they directly or indirectly comment on.